I went with a Sunday start instead of a Monday one so that I would have only 5 rows in the spread like I usually do. 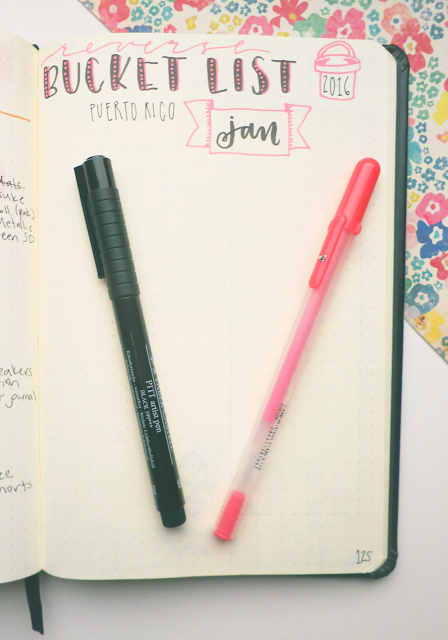 I knew that I don't need that much space for the miscellaneous column on the right (where I put random tasks and notes throughout the month), so since I was kind of in the spirit of change because of New Year's, I decided to add a goals section. This is where I'm going to put any big, general things for the month as a whole (e.g. "write more music" or things like that - things I want to do that aren't specific tasks). 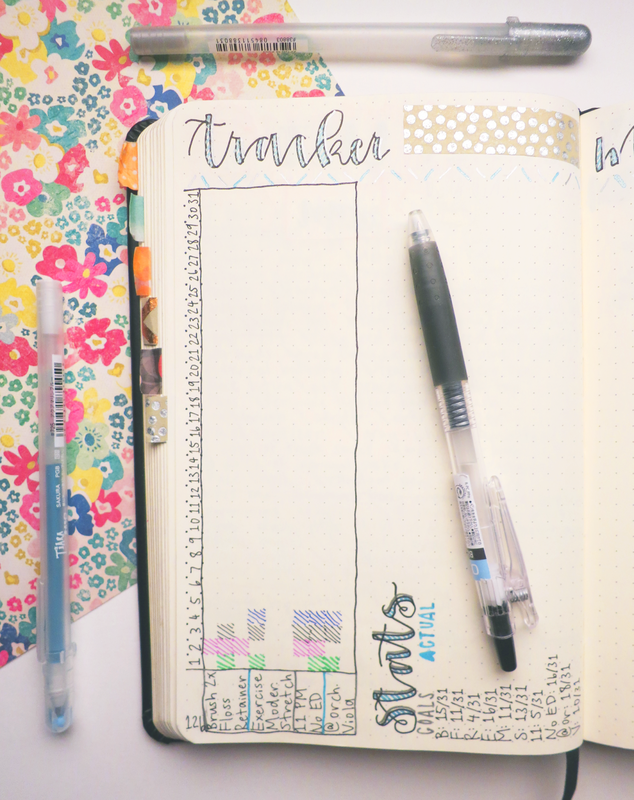 This month, my monthly tracker and memories spread are not right after the monthly layout like I usually do (since I messed up when making the spreads), but it doesn't really matter. Anyway, this month, I'm trying to be more helpful (efficient? productive? I can't choose a good word) with my tracker use. I'm taking a page Jessica's book by setting goals for each month. So, I counted up how many days out of the month I did each habit in December, and then I used those numbers to set goals for each habit in January. I hope that by having a concrete, quantitative target, it will help motivate me to do better for the habits that I'm tracking. Nothing special here; this is January's blank monthly memories spread, which is just a way to record the highlights from the month. 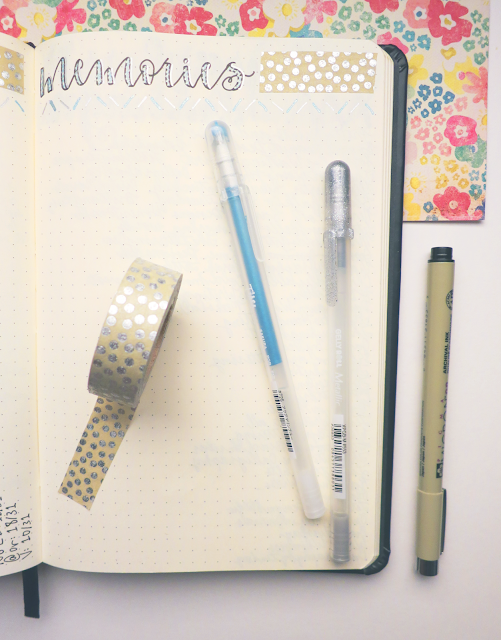 That's the short version of what this type of layout is, but I am planning on doing an entire post on monthly memories spreads in February. I actually haven't completed December's memories spread yet (oops . . .), so here's November's. 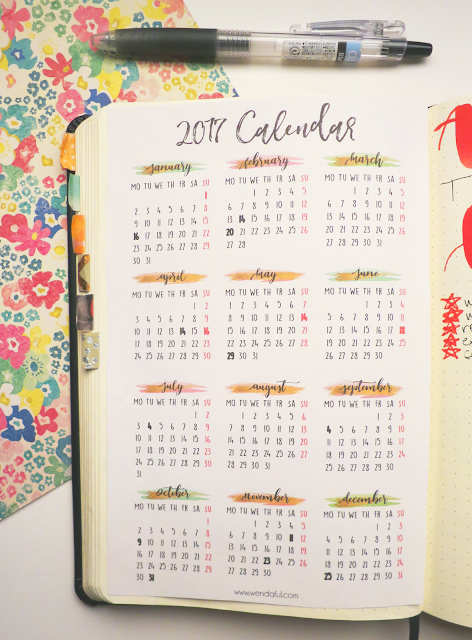 This is my year-at-a-glance calendar for 2017. I got this printable from the blog Wendaful Designs, which is the same place I got my calendar for last year. 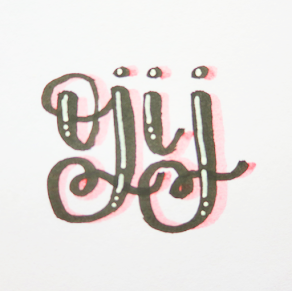 I decided to use a printable because it would've been really complicated and time consuming to figure out how to draw out something like this by hand. 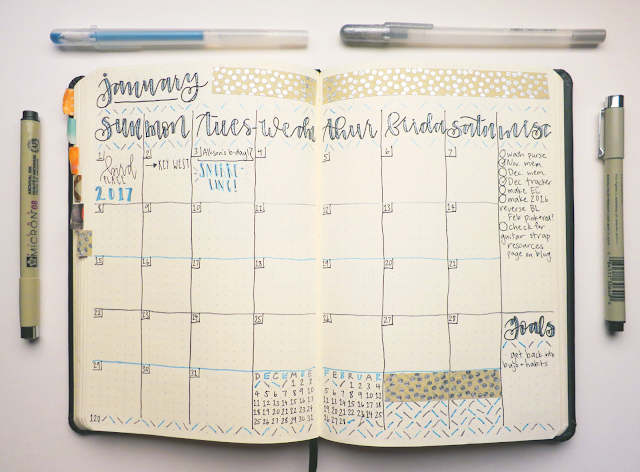 I'm not nearly done with this spread yet, but I wanted to show it anyway because I thought it was such a good idea. 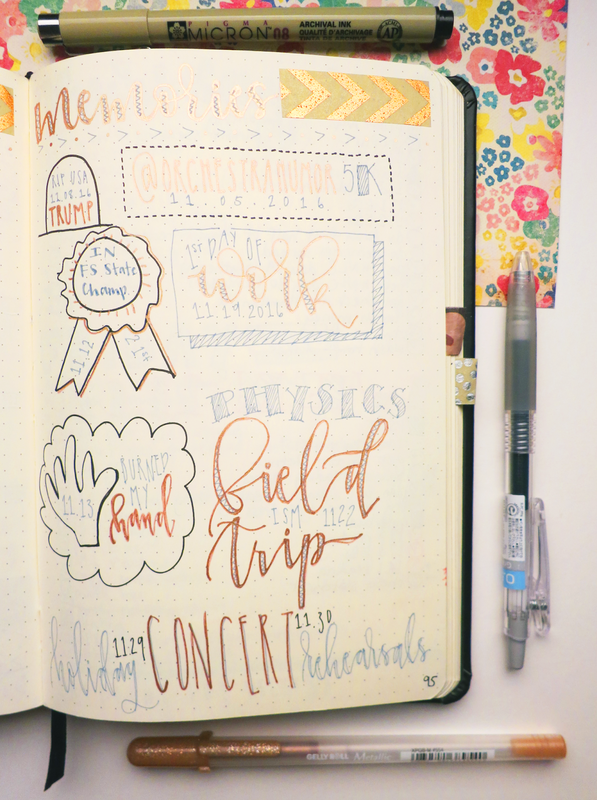 I originally saw this spread - a reverse bucket list - on @hb_letters's Instagram (though she was inspired by @calligraphynerd). Basically, you write out the awesome things that you did or that happened throughout the months. Though I haven't even finished brainstorming the items, I'm still really excited to complete the spread! By the way, if you're wondering why I didn't say anything about making a future log, it's because the one that I made when I first set up my current bujo back in August of 2016, it spanned 6 months, so it's good until February. I also didn't transition into a new bullet journal for the new year because that would be an unnecessary hassle and frankly a bit of a waste of about half a notebook. 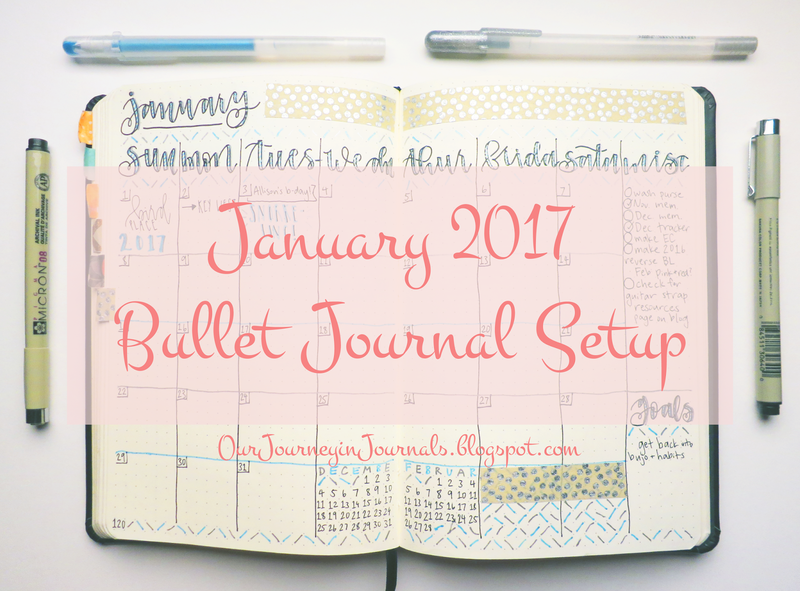 So that's everything in my January 2017 bullet journal setup! Tune in next week for my review of 2016 (which includes a reader survey, so I'll need as many people as possible to take it!) when it comes to Our Journey in Journals, and though it's gonna be a long post, I think it'll be an interesting read to see how my "brand" has developed throughout the year. How did you set up your bujo for the New Year? Let me know in a comment!